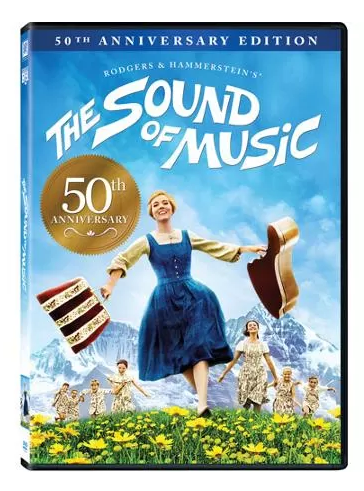 The Sound Of Music 50th Anniversary Edition DVD Just $9.96! Down From $19.98! You are here: Home / Great Deals / The Sound Of Music 50th Anniversary Edition DVD Just $9.96! Down From $19.98! Right now you can get this The Sound Of Music 50th Anniversary Edition DVD for just $9.96 (Reg. $19.98 at Walmart! Celebrate the 50th Anniversary of the most beloved family film of all time! Rodgers & Hammerstein’s cinematic treasure stars the incomparable Julie Andrews as Maria, the warmhearted young woman who brings joy and music to Captain von Trapp (Christopher Plummer) and his children. Experience this magnificent movie musical filled with unforgettable songs, including “Do-Re-Mi,” “My Favorite Things” and “The Sound of Music”. Optional Sing-Along Track, “Music Machine” Sing-Along, “‘The Sound of Music’ Tour: A Living Story”. Languages: English, French and Spanish; Subtitles: English SDH (Subtitles for Deaf and Hearing Impaired), French and Spanish.